The seed of the hemp plant produces a rich pure oil that is perfectly suited for dry hair and skin. Hemp oil is one of the few oils that are rich in the essentail omega fatty acids 3, 6, 9 and GLA. 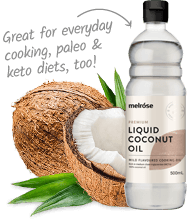 Melrose Organic Hemp Oil products are nourishing to both the skin and scalp due to the beneficial fatty acids which are capable of penetrating the skin's surface to regenerate the protective layers. It is well known for its deeply moisturising and conditioning properties.